Alfa Romeo 156 tuning by Marsiglio Car – proper DTM style! It’s no doubt, that the car races move motor-world. The power and the speed (which are tightly coupled) and also the design are the main priorities of cars, that have been modified for racing purposes. Famous races, as for instance DMT Championship or 24 hours Le Mans are well-known to almost everybody, and so are the cars. Roaring powerful machines are cruising the circuit, no matter if it’s day or night. In fact, these special racing cars are modified production vehicles. And it’s not a rule, that they must have most powerful stock engine under the hood. There are some people, who are not fascinated by huge discs, massive plastic materials or highlighted interior…on the contrary, they focus on modifications with attribute “racing” – sporting exterior and interior, and also improved power of engine. The DMT race is interesting with it’s vehicles, which can be seen on the road daily. Not in this rapidly modified version, of course. One of these sport car lovers is an Italian tuning specialist Marsiglio Car, which got down to tuning of Alfa Romeo 156 in DMT way. Italians have their own style as well as British have. 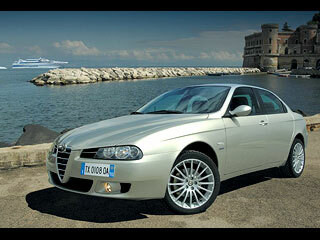 Italian passion, sensuality and temperament lifestyle was translated to their cars. Ferrari, Alfa Romeo, Fiat – these are cars full of emotion with a decent amount of immutable charm. Italian sensitivity reflected on every single vehicle, that was made. There could not be such a human that wouldn’t know the „snaky“ car company Alfa Romeo. Cars famous with their typical expressive front masks, which evoke only one feeling – perfection. Present model Alfa Romeo 156 represents this unique Italian style. Elegant, comfortable and fast, these are probably the most characteristic words for this sport car. The offer of engines is really varied – the owner can choose from among five engines, two of which are petrol engines. However, the most powerful among the offered is 2.4-litre Diesel 5-cylinder, which cooperates with powerful turbo. The maximum power, which can be produced by this system is 175 horse powers (129 kW) and torque 385 Nm. Outstanding performance and bloodthirsty design make of this car a high placed individual. Style of this modification is different from what we use to present on our pages. Sporting character, which can be find in majority of tuning styles, is little different in case of Marsiglio Car. Don’t expect jewelly discs, massive bumpers, look at this car with eyes of lover of fast wheels. DTM races – that’s what the Italian tuner was inspired by. This Alfa Romeo was modified into the shape of full-blooded racing car. The word racing describes the purpose and the essence of this modification. Such over-elaborate modification of exterior of a production car could not be seen for a long time. First to catch the attention is shifty white-red paintwork complemented with plenty of stickers of sponsoring and tuning-engaged companies. The character of race is fully present here. Massive front bumper with integrated robust opening of interesting design make us feel, that purpose of this modification is profound. The filling made of black expanded metal is a matter of course. In connection with braking efficiency improvement, at the sides of bumper were implemented openings a la shark gills – their function is to bring the air to rear brakes. In the lower part of bumper is located a large diffuser, which handles the correction of flowing air under the car. Maybe the most interesting change in the front part of the car is removal of the typical Alfa Romeo mask in exchange for longer hood. If this was the right step made by tuners – this is a matter of opinion. First „suspicious“ thing on this car were the front headlights. I don’t remember, Alfa Romeo used to equip its cars with lights of these dimensions and shapes. The tuners knew well what they are doing, and thanks to his initiative, the original lights were replaced by headlights from Mazda 6. Smart or useless? Depends on ones taste again. Also the front hood was endowed by two vents a la Mitsubishi EVO embedded in nicely shaped projection on the hood. It is really difficult to find words to characterizes side sills Marsiglio Car. Such number of openings, which handle the intake of cold air and off-take of hot air from and to the disc brakes, cannot be found on every car. The seriousness of this racing body kit starts to be evident. Together six openings conduct the hot air off the front brakes and four openings serves the purpose of bringing the cold air to the rear discs. The top of the milk are two round exhaust tips embedded in the rear part of these sills. The rear part of the Alfa Romeo 156 is not worse than the rest of the bodywork. Huge dark diffuser implemented into the rear bumper strikes the eyes and indicates, that resemblance with DMT cars is not an accident. Two more openings were added to take the hot air away from rear brakes. Pleasantly shaped bumper really fits the robust rear part of the car. the cover of the trunk is characteristic with adjustable razor wing, which is known from various racing cars. Certainly, it‘s not there just to show off ;-). All these parts of the body kit (the bumpers and side sills) continuously interlock with the aid of extended fenders, thanks to which the car gained 10 cm at every side. That’s not bad. In order to give the whole the final jazz, the popular system of vertical door opening (aka Lambo Style Doors) was installed. Do you need anything more? :-). The whole is finalized with stylish racing 17-spoke 19-inch alloy wheels shoed in low-profile tires Yokohama, behind them are disk brakes with holes TarOx B350 with 348x26 mm in front and 340x26 mm in the rear. The last ingredient is the sporting suspension, which consists of springs Eibach and dampers with shock-absorbers Bilstein. This system lowers the clearance height by nice 35 mm. This is professional attitude! Also the interior was Italian-affected. Its modification is work of native specialist Simoni Racing, which really enjoyed the interior adjustment of this beau. Red and black colors (mostly leather) are dominating the whole interior. This pair of colors can be found on adjusted sporting seats Simoni Racing and three-leg sporting wheel X-Race and on the gearshift lever handle made by the same manufacturer, and there are also new carpets. 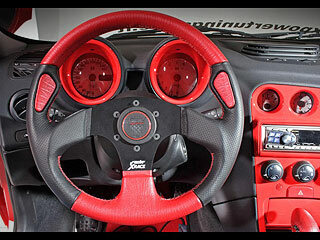 This two-color combination is supplemented by chromic elements – gear lever, pedal set and fire-extinguisher. What si your opinion about the Alfa Romeo 156 tuned by Marsiglio Car?